We bellied up with some veterans and lived to tell their tales. They may not offer well-considered lighting, cushy bar stools or froufrou drinks—certainly nothing with the suffix tini and not a single bottle of imported beer. But if there are a couple of things Veterans of Foreign Wars post canteens (a.k.a. 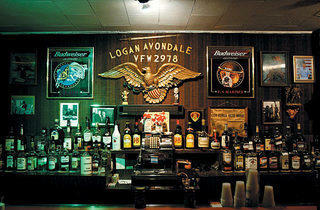 VFW bars) do have, it’s people and stories. For a VFW post, the canteen is the social hub, a vital meeting place where the men and women who served our country come to get served. In honor of Veterans Day (Sun 11), we headed out to some VFW pubs to have a drink with some Chicago vets. Our first stop: the Veterans of Foreign Wars Post 5079 Chicago Bridgeport (3200 S May St, 773-847-8404). Get buzzed in by the bartender speakeasy-style on any given evening, and you’re bound to spot 85-year-old World War II vet Anthony “Poki” Judycki (pictured). Just look toward the far end of the bar for the guy sipping on a cranberry juice (or, if it’s Friday, his weekly cognac) and chomping on a stogie like he owns the place. Don’t let his air of confidence turn you away; it doesn’t come from smugness. In truth, Judycki does sort of own the place. Even though he lives across the street, Judycki, twice a widower, feels his true home is the post, a place where the most expensive beer is $2.75 and the only provisions are pretzels and Slim Jims. His fellow vets are a surrogate family of sorts. “I live by myself; I’ve got nothing to go home to. So I always think why not go over [to the canteen]?” he says. 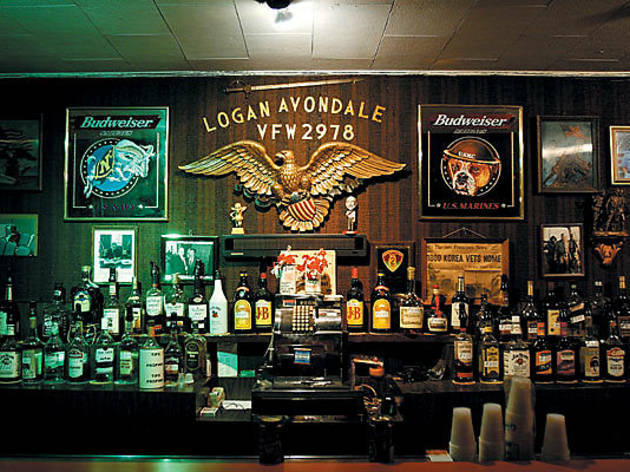 The same no-war-stories policy holds at Post 2978 Logan-Avondale (3007 N Kedzie Ave, 773-463-6748), a dim, densely decorated spot where the bartender has had to eject customers for talking about the war. “That stuff’s all in the past,” says post commander Terry Miracle, a former Humboldt Park gangbanger–turned–Gulf War Marine vet. (“It was either death, jail or Uncle Sam,” Miracle is fond of saying.) “Most people think in here is a bunch of old drunk veterans sitting around telling sob stories about war wounds. It’s such a cliché and it couldn’t be further from the truth,” he says. On a recent Thursday night back at the Chicago Bridgeport post, the canteen was uncharacteristically empty. “Everyone went to a wake,” the bartender explained emotionlessly, wiping a glass with a moist, white towel. Though the wake that night was for a member’s daughter, those at Chicago Bridgeport, like all VFWs, have grown accustomed to attending funerals and wakes, since the WWII vets are now in their eighties and nineties. Other VFWs are proactive in recruiting Iraq and Afghanistan vets to ensure survival. Logan-Avondale, for instance, sends care packages of razors, shaving cream and other toiletries to Iraq. It also has a full-time representative who helps the new veterans navigate the bureaucracy of VA hospitals when they arrive home. “These guys will come back and they’ll know that we’re going to be there for them,” Miracle says. “It’s all part of our mission,” he adds, pointing at a poster by the door of the canteen that reads, honor the dead by helping the living.